How to safely tell the kids about divorce! Children are sadly the subject of many divorce cases. Of course, it is always best to keep children from becoming involved in the actual case whenever possible. Most parents do not intentionally involve their children in the divorce process, but children can be unintentionally drawn into the parents’ conflict, potentially increasing the damage to and stress on the children as a result of the divorce. Based on many years of experience handling high-conflict divorce cases involving children, the following suggestions may help minimize the adverse effect on children whose parents are divorcing. At some point in the process of divorce and separation, all children need to be told about the changes that are taking place around them. The communication should be honest, supportive, and reassuring. Some parents find this difficult to do because they are angry, bitter, and grieving the loss of the other spouse and life as they knew it. Unfortunately, their fears and anger may be communicated to the children, increasing a child’s own fears and anxiety. To protect a child, a parent should make every effort to avoid criticizing the other parent or showing the depth of his own fears and anger. Kids need to think that their parents are good people, as their own self-worth depends upon it. Take the high road, and think about how your words will affect the children in the long run. Best of all, talk to a child development expert first to get advice on how to communicate with your children in an age-appropriate manner regarding the divorce. Parents need to exercise caution about what they discuss in the presence of the children. While most parents know that telling the children the details of their failed marriage or divorce conflicts is a bad idea, they may not exercise sufficient caution to keep the kids from hearing about it in other ways. Children listen when their parents are on the phone or are talking to other adults, and they may understand a great deal more than the parents realize. 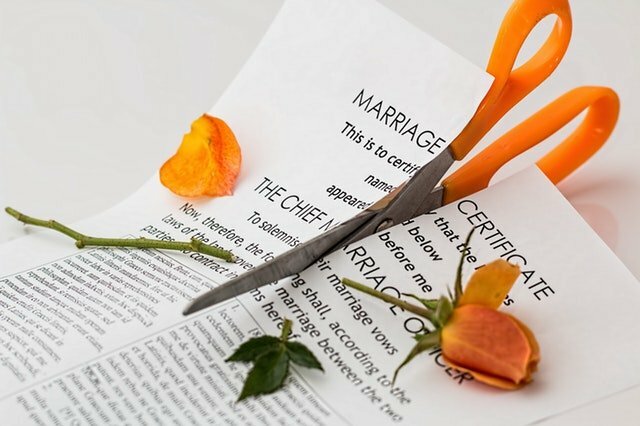 As you go through the divorce process, it is natural and healthy to talk with friends and family about the experience and to seek advice and counsel from people you trust. What is appropriate to discuss with friends and family is not usually appropriate to discuss with or in the presence of the children, especially if it involves criticism of the other parent, which is more often than not the case. In addition, the children should not hear about conflicts over money or a parent’s fear that they will not have enough money when the marriage ends. The divorce itself is scary enough without letting children in on the stressful details. It is also important to caution others not to talk about it in front of their children. When you talk to friends or relatives, and their children overhear their end of the conversation, it may get back to your children. It can be painful for children to hear information from their peers about their parents’ marriage and divorce, and it can be humiliating for them to know that their family is the subject of gossip. Therefore, be careful about how you share information and with whom, because your children can be hurt by unwitting disclosures of private facts concerning your family. Divorce is a stressful time for most parties, and divorcing parents often need a great deal of support to get through the process. Some parents unintentionally seek the support of their own children through their divorce, and this is never appropriate. Many children feel the need to adopt a caretaker role for one or both of their parents during a divorce, and this can be detrimental for the child and for the child’s relationship with his parents. If a parent is having difficulty managing his emotions during a divorce, especially in the presence of the children, then that parent should seek professional counseling to help him cope and to act appropriately with the children. Seek help and support from other adults but not your children. It is not unusual for parents involved in divorce to become involved with someone other than their spouse during the pendency of the separation and divorce, especially if the divorce takes months to finalize. While the parent may feel that he is ready to “move on,” the children may need more time. Children need to grieve the loss of the intact family that they have always known before being introduced to new adults that their parents are romantically involved with during the divorce. It is always a better parenting decision to wait until the divorce is resolved before a parent introduces the children to a new romantic interest. Although a judge is required to interview children age 12 or older in chambers if a party requests it (and may agree to interview younger children), there is no good time for a parent to ask a child where he wants to live. It is tantamount to asking the child to pick his favorite parent, which puts the child in a difficult and painful position. If a child asks whether he has a say in the decision, it is best to say that it is a decision that will be made by the adults. If parents will think about how their children feel and keep the children’s needs at the forefront of their minds during this difficult period, the children will benefit. When in doubt, parents should reach out for the advice of professionals, not their friends and family, about how best to care for the children’s needs during the parents’ divorce.